You Can't Take It With You was an installation that took place in a self storage shed at a Pubilc Storage facility in Long Island CIty. Curated by Flux Factory, participating artists were asked to make proposals for “first month free” storage spaces given to the artists by the group. For many poor and working class New Yorkers, driven from the city by rising rents and gentrification, a rented storage space for their life’s belongings is often the last toe hold they have on living in the city at all. Increasingly, a climate of rampant speculation now extends to the items stored in these storage spaces as well. 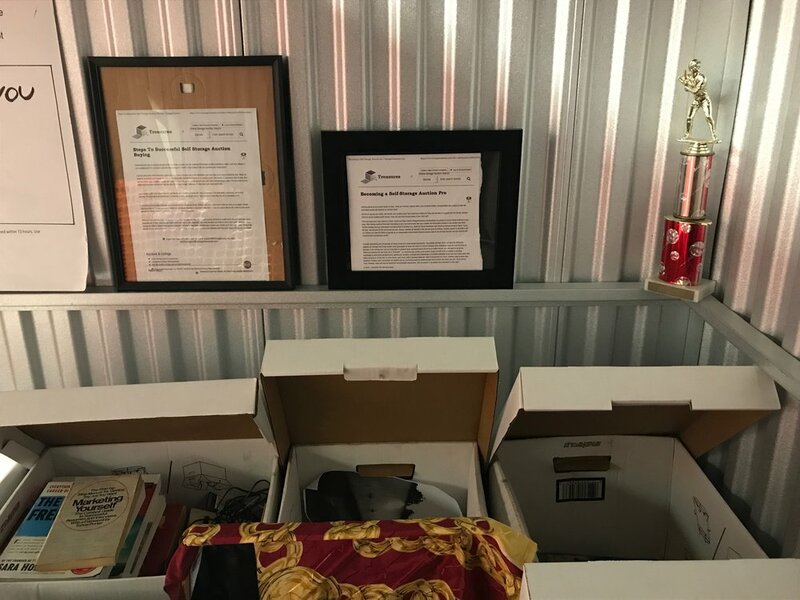 When renters become unable to pay the rent on these storage spaces, their belongings are sold to the highest bidder in public auctions which often take place online. The contents of sheds at auction can often be purchased remotely via online auction for as little as $1. Using the $75 provided to me by Flux Factory for the budget of this show, I will buy at online auction the contents of as many foreclosed storage units in New York City as I can. Using Public Storage’s offer of only $1 rental fee for the first month, I will store these items in my own storage unit until the month runs out on November 12, 2017, or until I can locate the former tenants of the foreclosed sheds and offer them their old stuff back. If I find them, they can have their items back immediately, no questions asked. I will ask these former tenants if they’d like to participate in the exhibition by selecting some of their own personal items and loaning them to me to display for the duration of the show. I will provide documentation of this search during the run of the show. In the meantime, I have made an installation in the shed using select items from these auction purchases mingled together in bankers boxes with my own sentimental personal belongings and personal papers, items found on the street and at junk stores, and contributions of unfinished artworks formerly saved in storage by artists Alicia McCarthy, Barry McGee, Bill Daniel, Jason Handelsman, Josh Macphee, Rigo 23, Sto Len, Sue Jeiven, and others. The installation will change throughout the show as more sheds are purchased, as more artists contribute work, and, hopefully, as people reclaim their stuff. When the show is over, any items not claimed will become part of the final artwork, available for purchase by collectors. If a collector purchases the installation, I will continue to search for the former owners of the stuff so I can split any proceeds equally with them. When the free first month is over, if the installation is not purchased, I will leave the installation in place in the shed and not pay any further rent, allowing the contents of the shed to inevitably go up for auction online again in a few months. Please feel free to lift the lids of the bankers box to view these discrete individual assemblages, and please take care to leave the installation as you found it when you are finished. for many poor and working class New Yorkers, driven out from the city by rising rents and gentrification, a rented storage space for their life’s belongings is often the last toe hold they have on living in the city at all. Increasingly, a climate of rampant speculation now extends to the items stored in these storage spaces as well. When renters become unable to pay the rent on these storage spaces, their belongings are sold to the highest bidder in public auctions. bid upon, sight unseen. Auction prices are ever driven higher by the slight but tantalizing possibility that the bins and bags of personal effects – ostensibly “worthless” in monetary value but priceless in terms of the renter’s memories – might be hiding an heirloom or valu- able collector’s item. 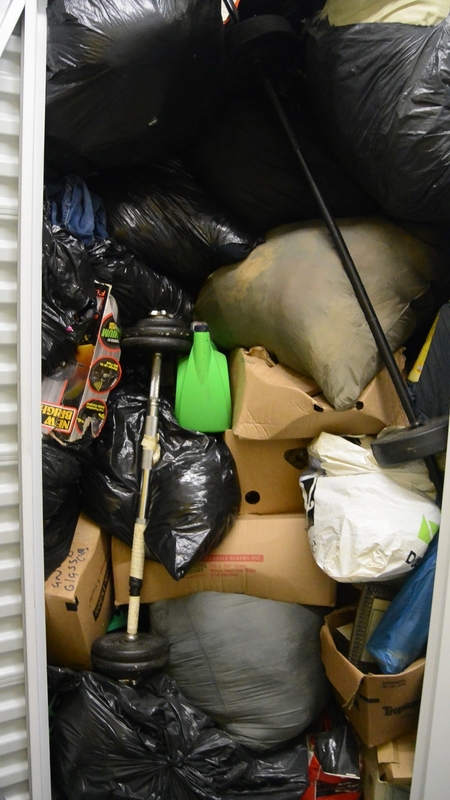 These auctions often take place online, with prospective shed flippers bidding on items remotely, their bids informed only by a tiny thumbnail jpeg photo of the contents of the shed. Items left in sheds that are not bid on are destroyed after the auction. But sheds can often be purchased for as cheap as one dollar. fastest growing residential neighborhood in the entire country1, adding nearly 13,000 new apartment rentals since 2010 – 5000 more units than the runner up, Downtown Los Angeles. The rezoning of the neighborhood to mixed use in 2001 has cleared the way for a forest of brand new luxury apartment buildings, most over forty stories tall, to appear along the Long Island City waterfront. Over 95% of the new units in the area are market rate and long-time residents face the pressure of increasing rents and the shuttering of affordable stores and restaurants. As the formerly gritty area gets a luxury facelift, Long Island City storage facilities have also undergone an upgrade. Long the site of a constellation of low-rent self-storage facilities like the one you are standing in, Long Island City is increasingly known for its art handling and fine art storage facilities. In these warehouses, art works -- items that have no real-life utility but nonetheless have an inflated market value based on their status as Art –often sit for years, out of sight and unvisited, in the same manner as the family photo albums and ancient scratched vinyl LP’s now languishing untouched in neighboring storage sheds. 2 UOVO Founder Steven Guttman on Why New York Needs a Futuristic Fort Knox for Art by Andrew M. Goldstein. Artspace.com from June 28, 2014. 4 “Caring for Your Artwork as The Summer Winds Down”, Uovo website. August 17, 2017. 5 “Art For Money’s Sake” by William Alden. In NY Times Magazine. February 3, 2015.